The Earth Science Museum at Moscow State University is located at the top of the Moscow State University building. Once a year the Museum opens its doors at the weekend and this is a unique opportunity to explore this imposing building from the inside! The Museum exposition is interesting, spread over 5 floors occupying about 2 500 square metres, it introduces the whole complex of Earth related sciences. We will learn the history of natural sciences development at the University and understand how the areas of Russia differ from each other. We will learn about weather and ecological situation in various regions of Russia, its flora and fauna. One part of the exposition is devoted to the exploration of Earth from space. The exhibition displays photos of the Earth’s landmass and oceans taken from satellites and the Space Station. The pictures are used for than decorative purposes, creating maps, for example. 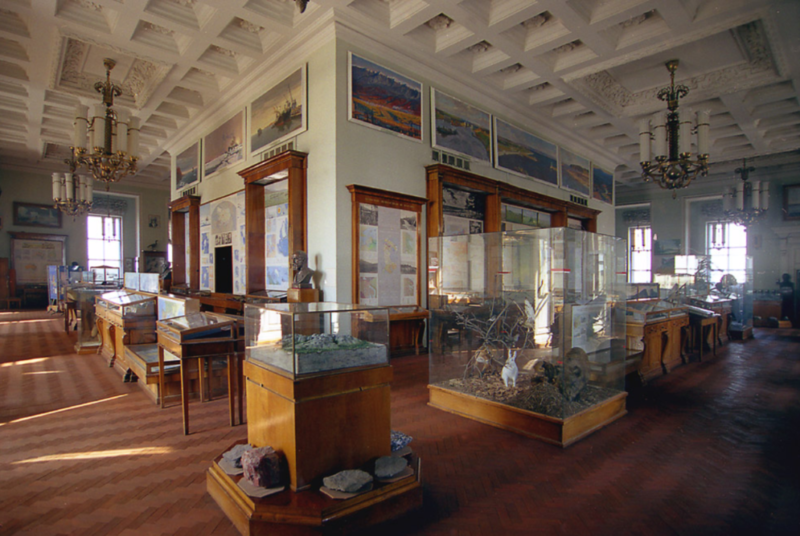 The floors occupied by the Museum are also of note from an architectural point of view, the exposition is decorated with sculptures, bar reliefs and portraits of important scientists. The central building of Moscow State University (MGU) is one of Stalin’s Seven Sisters, the supersized buildings erected on the instructions of the dictator and built between 1947 and 1953. Muscovites refer to the buildings as “Stalinist Skyscrapers” or vysotki. Built in a baroque-gothic style and using borrowed US skyscraper technology of the era, the buildings and MGU in particular are now symbols of Moscow. Once Stalin made a decision, things were actioned quickly and the new skyscraper vysotki program was no different. Building sites were selected in January 1947 with the official vysotki public announcement with the formal ground breaking ceremonies taking place on September 12th, the same year. The vysotki construction project had a hugely detrimental effect of on the real urban needs of Russians, reducing the available accommodation by half over the years, as evidenced by the following statistics: In 1947, 1948, 1949 respectively, Moscow built 100,000m², 270,000m², and 405,000m² of housing. The vysotki’s exceeded 500,000m² at a much higher cost per m². Designed by the renowned Soviet architect Lev Rudnev, the central tower of the MGU building had over-engineered steel frames, concrete ceilings and a masonry infill on a substantial 7m thick concrete slab foundation. The 15m² exterior ceramic tile panels are secured with stainless steel anchors. The main tower used 40,000 metric tonnes of steel and was built using thousands from the GULAG camp system. As construction progressed the prisoners were housed on the 24th and 25th floors, reducing transportation time to the work face and the number of guards required. The buildings were designed to be the biggest possible. Their mass was constrained by the lack of technology and skill rather than political will. Stalin was making a statement about the strength of Soviet society with his new structures, which were much heavier than the equivalent American buildings. 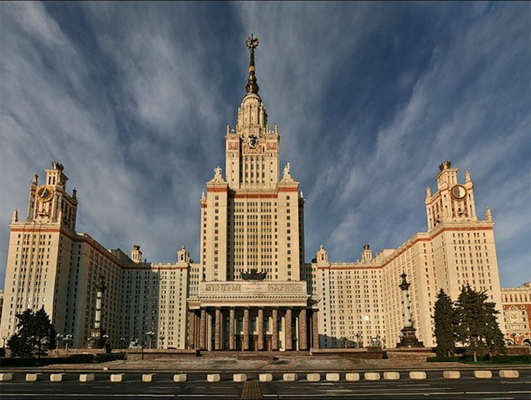 Inaugurated on 1st September, 1953, the MGU building is on Sparrow Hills, Moscow’s highest point. The silhouette is clearly visible from practically everywhere in Moscow including the outlying areas. At 240 metres tall (36 floors) the construction was the tallest building in Europe, until the Messetrum Office Building opened in Frankfurt in 1990. It still remains the world’s tallest educational establishment. Designed to remind visitors of the strength and power of the controlled Soviet society around them, the vysotki has very strong features including the dominating columns, guarding the access route to within. This MGU skyscraper sits as a behemoth, amongst 27 smaller buildings housing the various university administrations. The MGU University vysotki is 800m from the Moscow River. Adjacent to the steep slope leading down to the waters is the Sparrow Hills Observation deck, a ‘must do’ for all Moscow’s visitors. The viewing point gives an unparalleled view across the bustling Moscow megalopolis. Immediately opposite Moscow State University, across the river, is the world famous Luzhniki Stadium and beyond, all the city centre buildings including the Kremlin, Novodevichy Convent and the Cathedral of Christ the Saviour.